Thank you for your interest in one of Dallas Autos Direct's online offerings. Please continue for more information regarding this 2015 Maserati Quattroporte S Q4 with 36,917mi. Excellence, luxury and stature are just a few of the pillars this car is built upon. When the Maserati Quattroporte S Q4 was created, it was automatically enhanced by having the performance ability of all wheel drive. Not only will you notice improved steering and superior acceleration, but you can also rest easy knowing that your vehicle comes standard with increased stability and safety. This low mileage Maserati Quattroporte has barely been touched. It's the next best thing to buying new. More information about the 2015 Maserati Quattroporte: Maserati's Quattroporte is the original large sporting luxury sedan, with a proud Italian history dating to its first iteration in the 1960s. It now competes in an exclusive segment that includes offerings from Porsche, Aston Martin, Audi and Mercedes-Benz. "Carrozzeria" Pininfarina contributed to the car's distinctive shape, and Ferrari provided technical assistance, as well as a pair of stellar V8 engines. 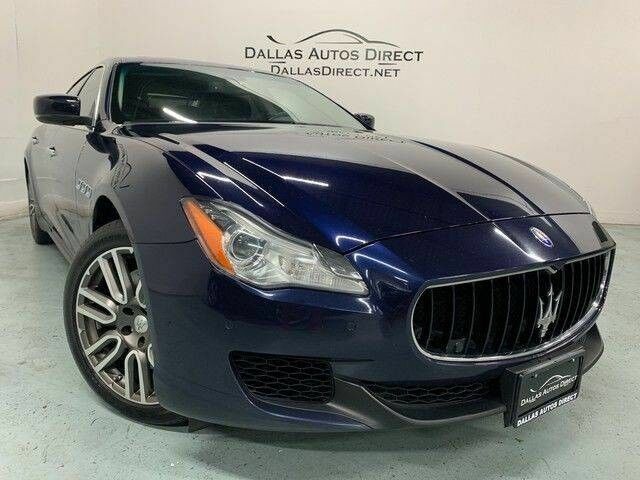 In the Quattroporte, Maserati shows how perfectly it can blend strong performance, design, refinement and the highest levels of luxury in an unmistakably Italian automobile. Interesting features of this model are Aggressive new design, crisp, sports-car-like handling, exclusivity, ultra-luxurious cabin, and two impressive and powerful engines Finance available with applicable fees.